You probably know there are a lot of genres in the voiceover industry that you can get work in. And, of course, that’s not an exhaustive list! There are more genres and niches to be listed, and I cover several of them in detail in the Voiceover Success Intensive course. But one of my favorite types of voice over work to do is e-learning, or online course narration. I actually have a bit of a soft spot for it because it has played such a massive role in building up my business. There are so many reasons why I love doing e-learning voiceover work. Aside from the fact that the e-learning industry is growing rapidly, there are a lot of cool perks that come along with doing voiceover work for digital courses.One of these is that you get to learn new things! 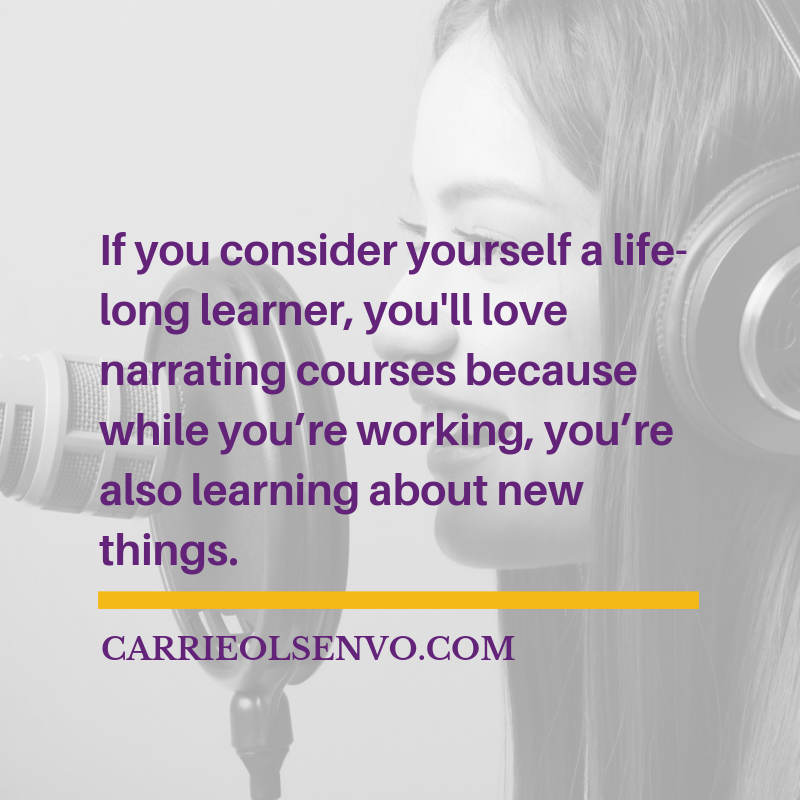 So if you consider yourself a life-long learner, you’ll love narrating courses because while you’re working, you’re also learning about new things. And sometimes, the subject matter is really interesting. Another cool perk that comes with it is that it can be a really nice and consistent source of income if you get in with the right clients. The e-learning industry is growing. It’s a good avenue to learn about new and interesting things. It can be a consistent source of good income with the right clients. Of course, it has its challenges, too. For one, it is more time-consuming compared to a lot of other types of voice over work – like, let’s say, a 30-second commercial. Most e-learning scripts are on the longer side, so when working on them, you’re recording for a long period of time and reading a lot. Consequently, that also means that there’s a lot of editing that needs to be done.But the good news is, with the right workflow(s), you can make the daunting task of editing large amounts of audio a lot more manageable! 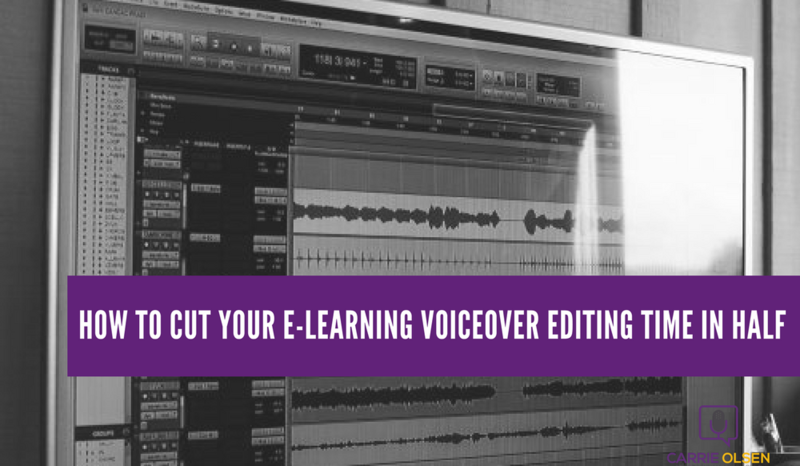 In this post, I’ll share with you two shortcuts you can use to cut your e-learning voiceover editing time in half. I learned about this nifty plugin during a studio session when the engineer told me about it. He was super excited about it, so I knew it had to be pretty cool. What Recorditor does, is it allows you to mark your good and bad takes during a recording, and then it performs edit decisions automatically, leaving you with only your good takes.So if you’re recording long-form work like an e-learning script or an audio book, and you don’t have the ability to edit in real-time or do a “punch and roll” (another time-saver for voiceover editing), this is a great option for you. How it Works:While you’re reading through and recording, you mark sections as good or bad as you go along. Then once you’re done, you just need to hit the “Commit” button. It will then render a “cleaned up” recording by removing the bad takes and leaving behind just the good takes.Why it’s Great:It saves you the time of having to go back and listen to everything to manually edit out the bad takes. It automatically does that for you. As you’ve seen on the video clip above, you can save a lot of editing time using Recorditor as you’ll be left with this solid, awesome recording once you hit the “Commit” button. It’s like magic, right? If you’re as excited to try this as I was when I heard about it, right about now, you’re wanting to know how to get this thing. But there’s a caveat to this plugin at the moment – it currently works only for Pro Tools. They might be extending support for other brands of recording software in the future, but for now – it can only be used with Pro Tools. But if you don’t have Pro Tools, so now your dreams of faster editing have been crushed, don’t fret. The next thing I’m going to show you is how you can replicate what Recorditor does so that you can use it in your own workflow using the recording software you have. This works with most recording software that allows you to insert markers as you’re recording. 1. Setup a shortcut for the marker in your recording software.For ex: I setup the letter “M” in my keyboard to trigger a marker on my audio file.2. Establish marks for good takes and bad takes.For ex: In my case, I use one marker for good takes and two markers for bad takes. So while I am recording, once I finish a section without mistakes, I’ll add one marker (so I’ll hit the letter “M” once). If I make a mistake, I’ll put two markers (which means I’ll hit the letter “M” twice).3. Chunk your e-learning script into sections.Occasionally, scripts will already come chunked pretty nicely when they’re given to you. But if you get it in paragraph form, you’ll have to go through and chunk it up yourself because you will have to have distinct predetermined sections that you’ll be using for your takes. This will help you identify when to put the markers in place.Tip: You don’t want to make your sections too long because if they’re too long and you make a mistake at the very end, you’ll have to go back and rerecord the whole thing. If you’re pretty good at recording long sections without mistakes, then they can be a little bit longer. If you’re newer, it is advisable to keep your sections shorter.4. Record your script and add the markers as you go along.After every section that you read, put a marker if it’s a good take. Every time you make a mistake, put the marker you’ve set for bad takes and re-read that section again. Continue adding markers until you’re done recording.5. Delete your bad takes.Once you’re done recording, you need to go to the end of your audio file and start deleting the takes that you have marked as bad. Leave the recording preceding the marker you added for good takes. For those where you have markers for bad takes, you have to highlight it backwards up to the end of the last good mark, and delete that part. And that’s it! After you do those steps, you’ll be left with a recording that doesn’t have mistakes! Of course, the recording won’t be broadcast-ready yet – you will need to do more polishing like reducing spaces and removing breaths – but at least you don’t need to listen to the entire recording, manually identify and delete bad takes, and splice together what’s left. Save the original file first before you delete bad takes. In case you made mistakes in deleting parts you shouldn’t have, you can go back to the original file and do it again. That will save you from having to read and record again. Initially, take the time to listen first to the bad takes before deleting them. If you weren’t marking properly, you will end up accidentally deleting good takes. Be consistent with the markers that you’ve setup and do them continually. Marking while you’re recording will become easier after a while. I hope you learned something from this short tutorial on how you can potentially cut your editing time in half when you’re recording e-learning. If you did, drop me a line in the comments section below and let me know. Talk soon! Want to book more e-learning narration work? I want to book more!